This entry was posted in Substance Abuse and tagged Preventing Misuse, Signs and Symptoms on June 23, 2016 by Team Addiction Hope. When synthetic marijuana first started showing up in head shops and gas stations, countless drug users thought that their prayers had been answered. Artificial marijuana, sold under brand names like “Spice” and “K2,” does not show up drug tests and it could be purchased legally across the country, making it the go-to substitute for pot for those wishing to keep their drug use a secret. This initial excitement quickly turned into fear when the truth emerged about this dangerous new substance. What Makes Spice So Dangerous? One of the most troubling facts about synthetic marijuana is it’s very often produced in underground Chinese laboratories where there is no official oversight or regulation. There is no way of telling what chemicals you are ingesting when you smoke Spice. Also, as soon as the U.S. government is able to regulate one form of synthetic THC, foreign chemists invent a new one, making it impossible to study the potential side effects in time to warn the public. And because there is no governmental oversight, the drug’s potency is always changing. Spice and K2 are made by manually spraying plant material with synthetic chemicals, so it is possible to have one package that contains no psychoactive compounds, while another is many times stronger than advertised. This unpredictability makes it nearly impossible to keep track of how much Spice a user has ingested. It should also be noted that when synthetic marijuana was first created, it was never intended for human consumption. K2 was first developed by John W. Huffman, a chemist working out of Clemson University in South Carolina. In a recent interview, he was asked what he thought about recreational use of the drug, and he responded by calling K2 users “Idiots.” According to Huffman, K2 was only produced to study how the brain works, and it was never even tested on humans before it hit the open market. Even though there have been recent efforts to educate the public about the dangers of synthetic marijuana, poison control centers continue to receive hundreds of call each month from people who have ingested the drug. Nationwide, calls regarding synthetic marijuana more than doubled between 2014 and 2015: from 3,682 calls in 2014 to 7,779 the year after. Even though synthetic marijuana is designed to mimic the effects of the THC in marijuana, the fake chemicals can have widely varying effects. 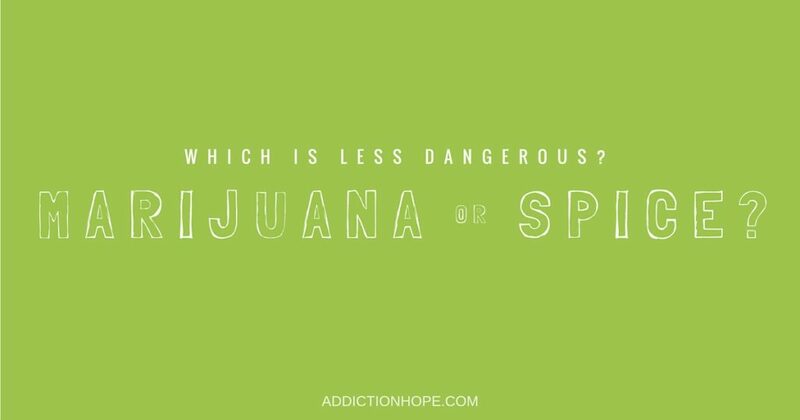 Some varieties of synthetic marijuana are more than 100 times more powerful than the real thing, which makes them much more dangerous. What Is Overdosing On Spice Like? Because these designer drugs have not undergone rigorous study and testing, experts are still unsure of exactly how they act in the human body. What is known, however, is that people who overdose on Spice are suffering from heart attacks, kidney failure and even death. The psychological effects of Spice are potentially so strong that mental health experts are likening them to the symptoms of schizophrenia, where there is a complete break from reality coupled with paranoia and delusions. What concerns do you have about the recent epidemic of synthetic marijuana, and what do you believe should be done to protect young people from this dangerous drug? Share your thoughts in the comment section!